We hired a room/master suite on the top floor with a great view. The room smelled of sewage. They said they would repair it but the repair failed on three consecutive days. Finally they changed us to the same room on a lower floor. Also they cannot climate control so the room was terribly hot (30 degrees) at night. We hardly slept. After changing rooms it was alright. We asked for one day off the bill as compensation. They offered us access to a private lounge but never gave us any information on using it, besides which we were not interested in that feature since we spent most of our time outside of the hotel. Even after contacting the regional management they rejected our request for fair compensation. For a premium hotel we have never been treated so shabbily. We will NEVER stay in a Melia hotel again. Hotel tip: Philosophy of Melia Hotels: the customer is always wrong. all the food was freshly cooked in front of you steak, ckicken,fish etc just the way you want it. I have stayed in Melia Hotels in other areas and they all seem to live up to a high standard. The hotel itself is always very clean and the rooms are cleaned daily with bed linen changed 3 times per week. The rooms are all carpeted, so you do not have the noise of the people above you walking aroung all the time. All rooms have a balcony facing the sea and it is very nice to just sit on the balcony looking out at the water. The beach is just across the road, and the town is very easy to reach via a lift outside the hotel which costs only 0.5 euros each and this saves you a long walk up stairs. Plenty to eat at breakfast and dinner buffets. Not much entertainment in the hotel, but it is November and the hotel was quite. lovely hotel although food could have been a bit warmer it was O.K.rooms cleaned to a high standard as were public areas and staff very friendly and helpful.the location of the hotel was fantastic,right opposite the beach and a nice easy stroll either way for bars and restaurants.didn,t stay in at night so can,t comment on entertainment. 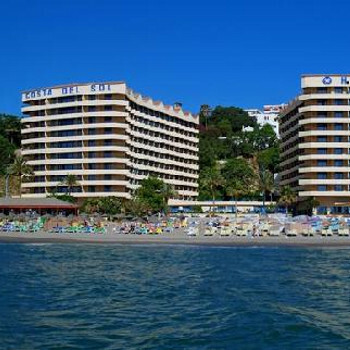 Please note that there are 2 melia hotels in Torremolinos (Hotel Melia Torremolinos and Hotel Melia Costa del Sol - this one is on Playa Bajondillo and is the one I've stayed in many times). Hotel is very clean, large with 9 floors and all rooms overlook the sea and have balconies. The hotel is used by the flight crews from Malaga airport (about 7 miles away) and businesses as well as tourists, and is in easy travelling distance from the airport (taxi 12-15 euros each way). Breakfasts are excellent with very wide range of things to eat, although I haven't sampled main meals in the restaurant due to the wide range of local 'eateries' around the hotel. Its location is excellent, virtually on the beach (separated by small beach front road). I have generally booked direct on-line, although 'Hotel Club' website prices are sometimes lower. The area is much nicer than the main Torremolinos town hotels but is linked to the town via shop-lined stepped path. Hotel staff on reception can be a bit cool at times, but ok.
Entertainment is a bit amateurish (depends on what you're used to) but ok. Overall I think this is an excellent hotel and would not choose to stay anywhere else (have stayed there about 8 times). Highly recommended if you're after a nice place to stay and love the beach.